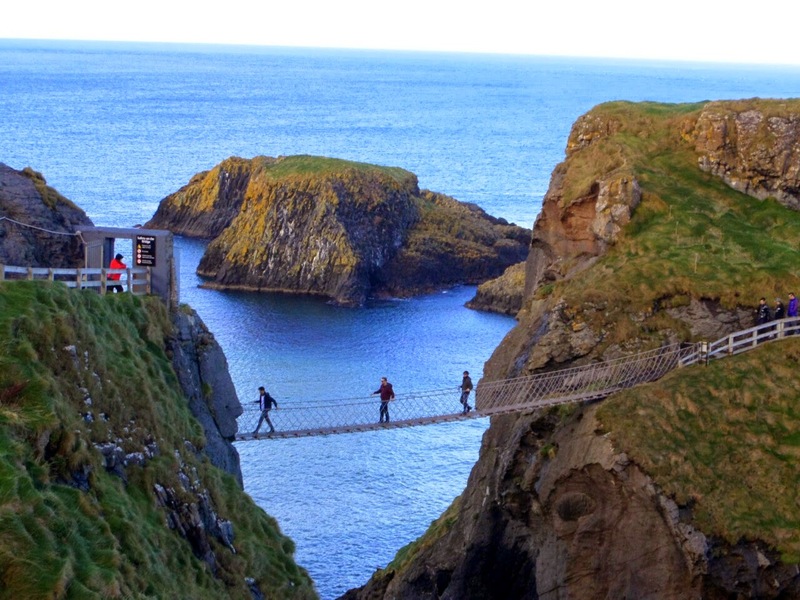 So we abandoned our exploration of the Wild Atlantic Way to visit Derry for Halloween. Australia does not take Halloween very seriously and we wanted to get the full Halloween experience from a place that does. Well trust me, Derry takes it very very seriously. There had been celebrations going on all week, shops, houses and restaurants were adorned with skeletons and ghosts and by the time the big day arrived around half the people in the city were covered in elaborate costumes. The medieval wall that surrounds the old town had circus performers riding around on big bicycles, doing acrobatics and blowing fire every night during the week. Parts of the wall were very dark and children would appear out of nowhere in ghoulish costumes and scare the s*** out of you. 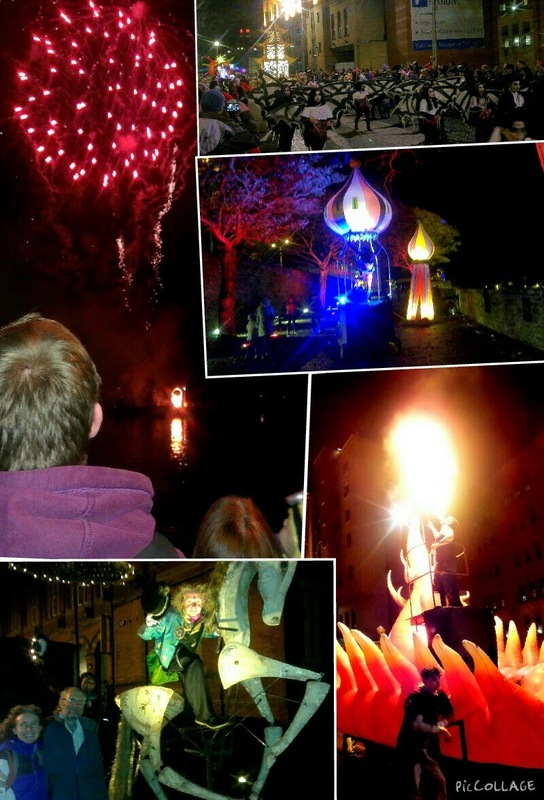 The night itself saw a huge parade with floats going past for about half an hour followed by huge fireworks over the river Foyle. The city stayed buzzing with excitement until the wee hours and many pints of Guinness were drunk (not by me though). 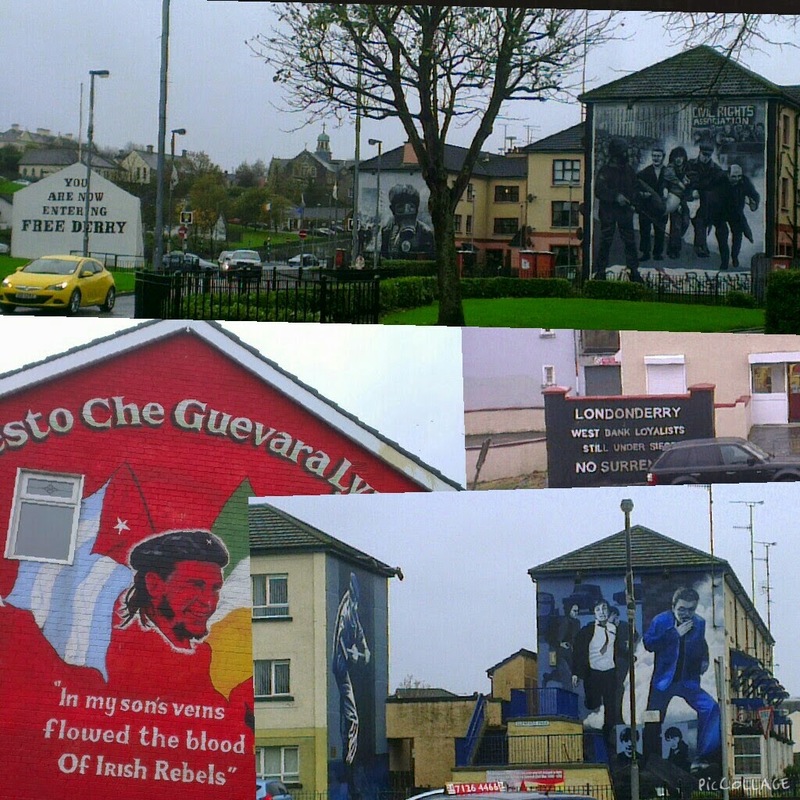 Derry is steeped in history and has been a focal point throughout the ages. It sports the only remaining completely intact walled city in Ireland and you can walk along the top of the wall all the way around. The wall was never breached despite numerous attempts. Bloody Sunday occurred here in 1972 and we visited the guildhall where the inquiry into the massacre took place. It was bombed several times but has been renovated and is a magnificent church-like structure. We were offered a free tour while in there and an enthusiastic entertaining gentleman in a typically Irish storytelling style proceeded to give us a thousand years worth of history as represented in the stained glass windows in the multi purpose hall. 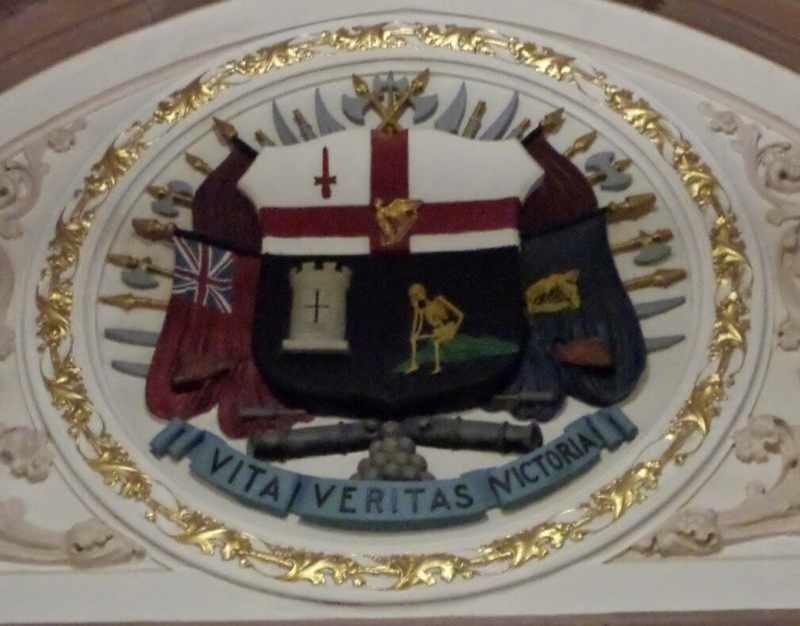 The Derry city council meets here to try to progress a peaceful agenda but all around the city are reminders of the past and that there is still a long way to go. 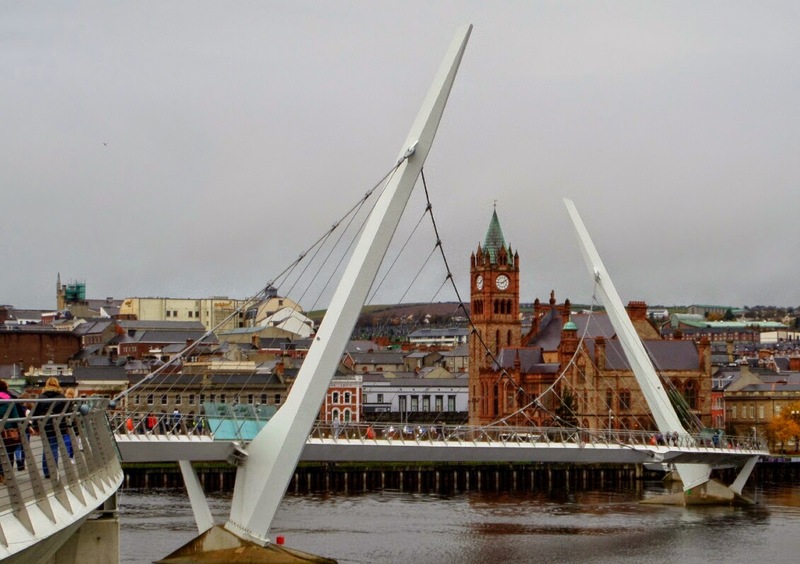 Even the city's name is contentious; it is widely known as Derry but its official name is Londonderry and the two names are used interchangeably in most facets of the city and on signs. 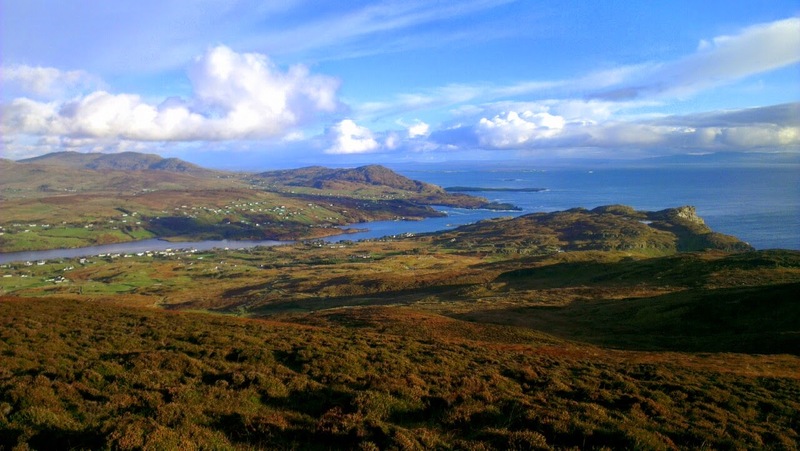 After Halloween we extended the car hire for another week to catch up on the Wild Atlantic Way again. 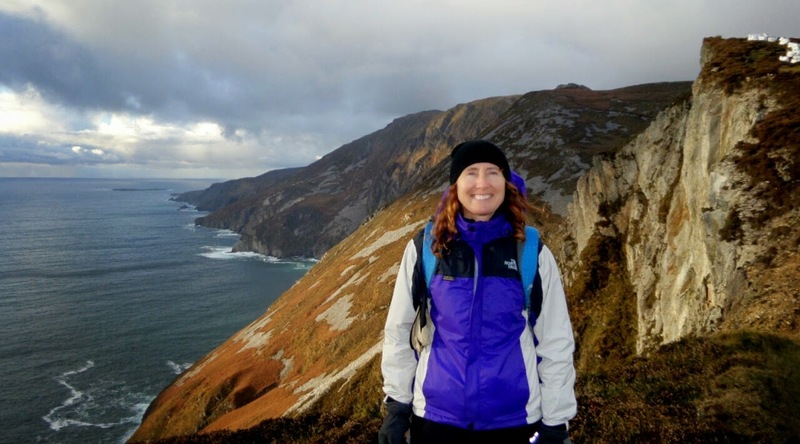 One of the first places we visited was the cliffs at Sliabh Liag. 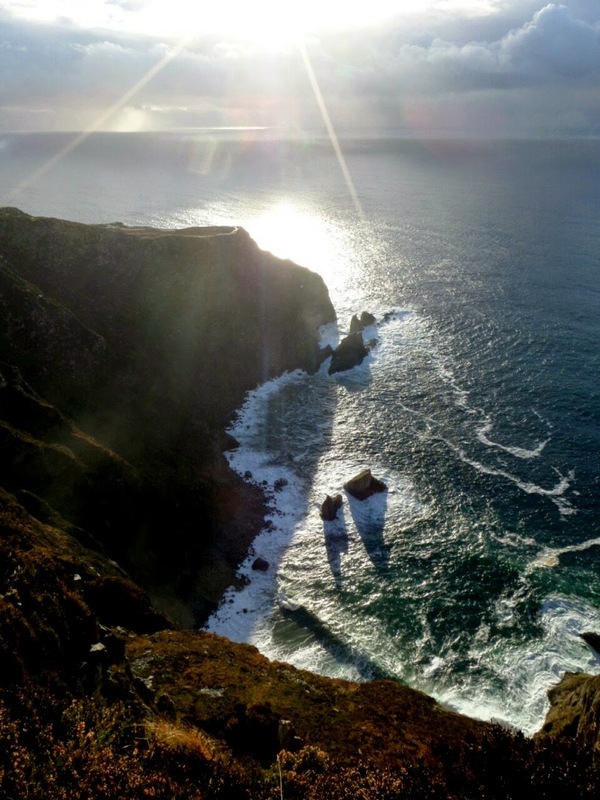 Remember when we said the cliffs at Achill Island are the highest sea cliffs in Europe? Well, these ones are the other highest sea cliffs in Europe. 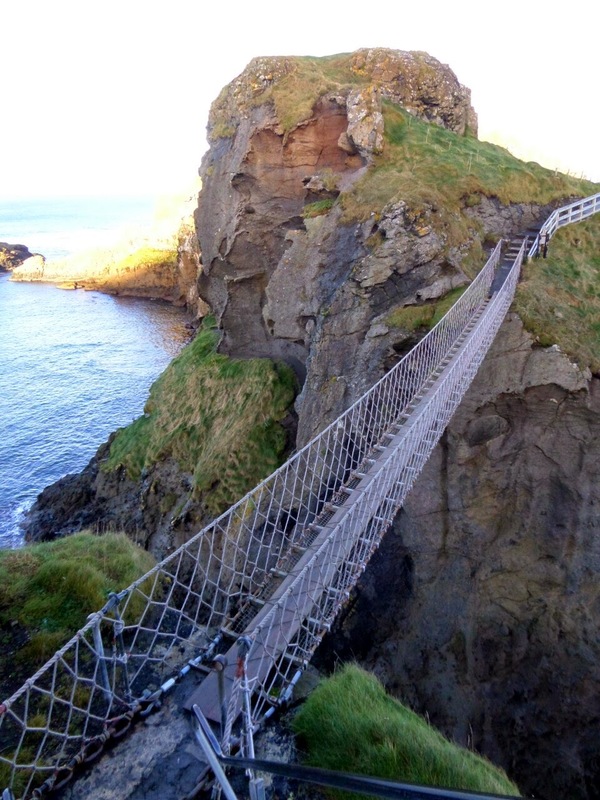 I wonder how many 'highest sea cliffs in Europe' Ireland has? Nevertheless they were beautiful and high, but again very marshy and bog ridden trekking. I have just about destroyed my hiking boots and they are not even a year old. Will need to replace soon or stop hiking, as my feet are getting cold and wet. Hostels in Ireland are really hospitable. 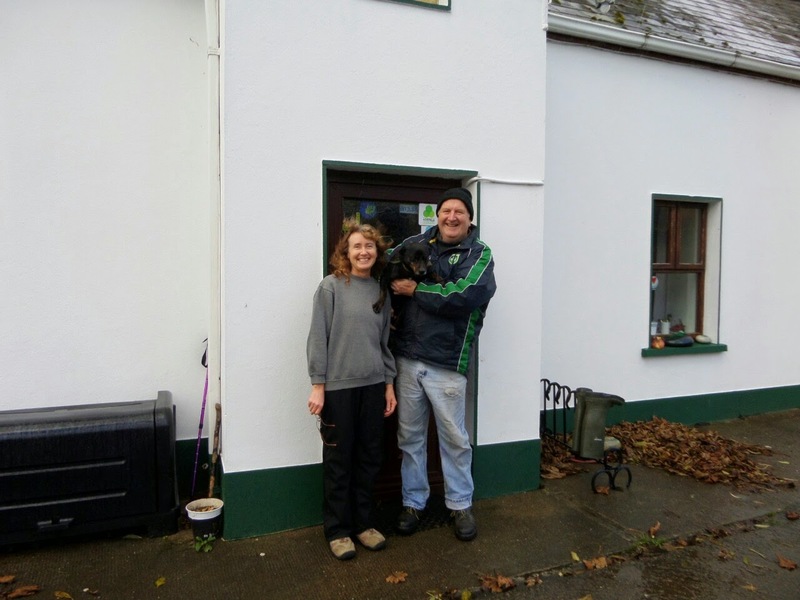 We stayed at a lovely one called Derrylahan with owner Shaun and his dog Lucky. With a fire going every night in the large lounge, we would make dinners in the large kitchen and Shaun would entertain us with stories in the way only the Irish can. The hostel was part of a working farm and Shaun would be relentlessly shooing his sheep out of the garden. We had this kind of welcoming experience at lots of hostels in Ireland. 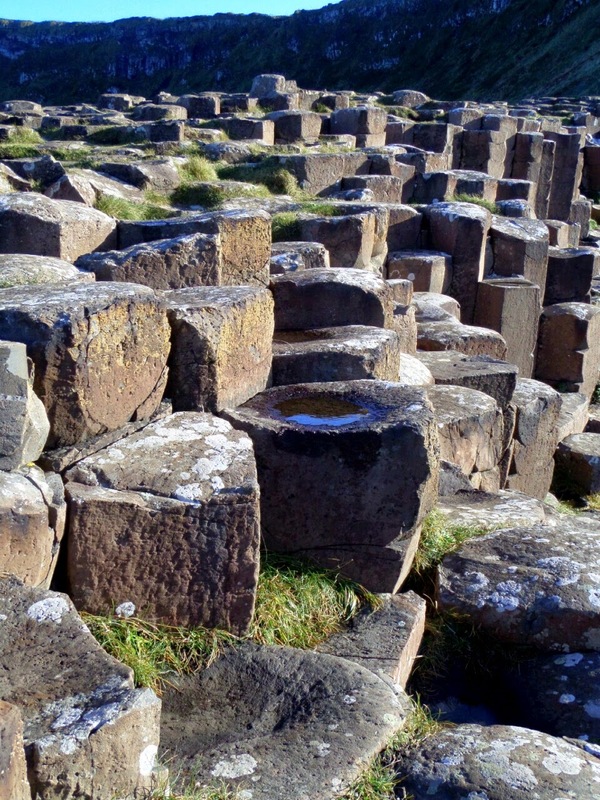 As we continued along the Wild Atlantic Way we came across many more fabulous sites. 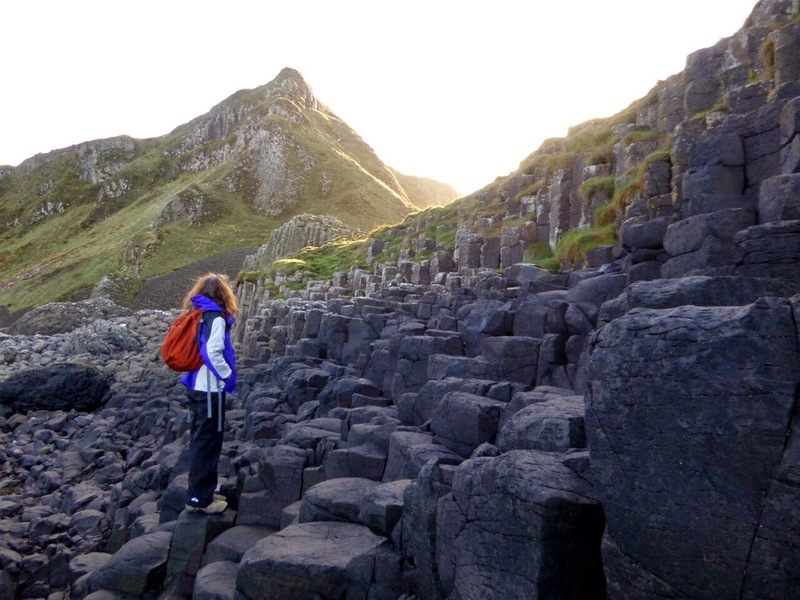 The last one I will mention is the Giant's Causeway (not strictly still on the WAW as it's further around on the coast of Northern Ireland). 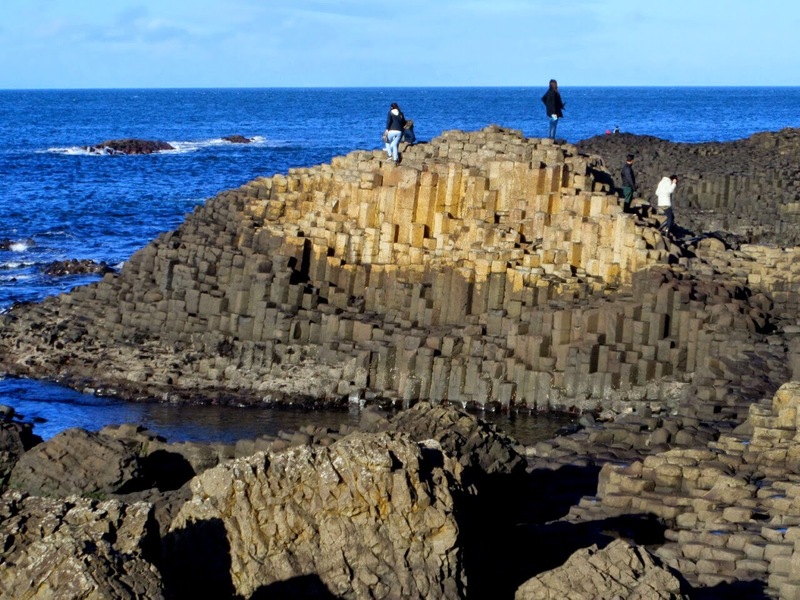 Folk tales abound to explain the mysteries of these weird rock formations that look like paving bricks placed uniformly on the shore but are really really thick, like giant toothpicks stuck in the ground. Created over 60 million years by volcanic eruptions and geologic activities or by the shenanigans of the giants Finn MacCool and Benandonner and Finn's wife Oonagh, depending on which story you want to believe :-) They were certainly worth the visit, and try to get on a ranger hike from the visitor centre as they are always a mine of useful (and useless but entertaining) information. We eventually made it all the way around and back to Dublin for a few days R and R and then a ferry across to England. Bye bye Ireland.